For companies with presences in multiple countries or planning to expand globally, having a flexible IT architecture is essential for business growth. Such companies need high stability and superior quality of networks to keep pace with technology and changing demands. The primary issue for such companies is the critical need for an efficient and secure network to connect their sites around the world. Leased lines from telecom carriers is a costly option for small or mid-sized enterprises. 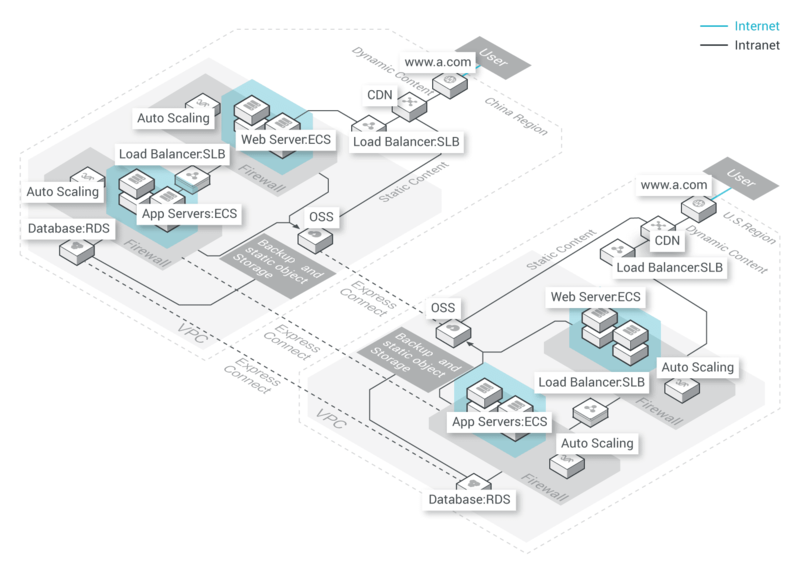 This architecture meets the demand of multi-node deployment across different regions. An application that is deployed in China can also be deployed in the U.S. region at the same time. To ensure smooth operations, the two applications need to communicate with each other at the service and data layers. Using Alibaba Cloud Express Connect the two VPCs, located in different regions, are connected through a dedicated line, ExpressConnect, allowing ECS instances in the China region to access ECS instances in the U.S. region through the intranet. The two RDS instances in different regions can also synchronize data in real time. For a large volume of data replication, Alibaba Cloud OSS allows for cross-region data replication through the Internet. Download the solution architecture to learn more about its use and application. Learn more on how to get started with Alibaba Cloud ExpressConnect. Learn how to quickly and efficiently set up your Virtual Private Cloud.